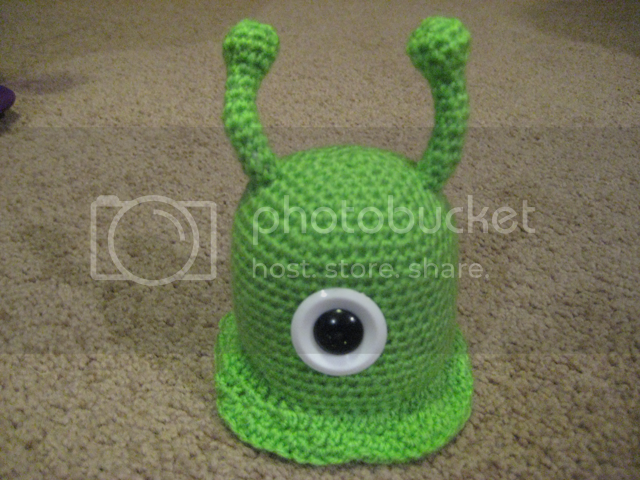 Crafty Bikyclist: Futurama Brain Slug! I love Futurama, and what better way to show that than making my very own brain slug? I can't remember where I first saw a crochet one, but I knew I had to make (at least) one asap. Pattern is well written and its simple to make. Hardest part was sewing on his eye, two buttons that fit so perfectly together you'd think they were designed for this exact purpose, I just didn't have a long enough needle! I think I'm going to put him on a hair comb, one of those plastic thingies that you slide into your hair to hold it in place? I'll be all set if I ever need a costume! Free Brain Slug Pattern, from Hookandneedles.com. О! What a nice post. I really love reading these types or articles. I can?t wait to see what others have to say. I am so jealous of you! I'm a "real" Futurama fan and I've always wanted to knit a futurama character of my own. But I've absolutely have no idea (also no talent) how to knit so it will always be a dream... Anyway your slug is great but maybe that thingies on top is just a little bit thick, I think. But it sure lookes lovely! I totally agree with you in that the antennae are too thick, I just couldn't get them to stand up properly unless they were that thick. :) next time I'll make them thinner and use wire to help.